We've been in a gaming mood more often these days! Part of it has to do with the fact that our 2-year-old is just beginning to be able to appreciate board games... although, as of yet, any actual method and order of gameplay continues to elude him. But, our game for the day is for a rather more mature audience -- that is, about third grade and up! 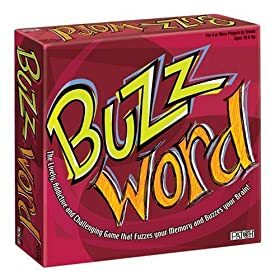 Buzzword is a great party game, right along the lines of Taboo, but with even more group action. You get the idea. Some of them are pretty quick and easy -- others, not so much! And any clues in the round that the reader can't get his teammates to guess, are made available to the opposing team to score their own points from. As with most games like this, the more players, the better. (Although it could be played with 4 people, it would definitely not have quite the collaborative team spirit.) Half a dozen players is a good starting point, and you could go all the way to 10 or 12 with no trouble. sounds like a fun game- thanks for hte review!